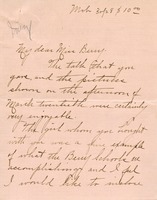 To The Berry Schools From Mrs. Joel Ellis Fisher Jr.
A letter expressing her admiration for Martha Berry's work and interest in supporting Case No. 1 from the catalog of letters children wrote about why they should go to Berry. This letter is attached to a $10 check. $10, Berry Catalog, Case No. 1, check, donations, Mrs. Joel Ellis Fisher Jr.
Mrs. Jones congradulates Miss Berry over a speech and picture show she led on March 20th. Mrs. Jones also enclosed a check for $10 to the school. Mrs. B. 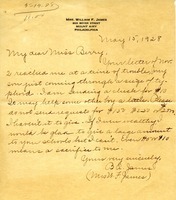 A. James, married to Mr. William F. James, asks Miss Berry to stop requesting large sums of money from her family due to her son being ill, but still encloses a check for $10 to the school. 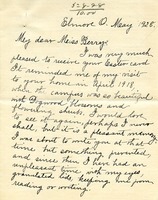 Mrs. Jaeger was pleased to receive the Easter card Miss Berry sent over as it reminded her of the time she visited the school in 1918, mentioning that it will forever be a pleasant memory if she can never visit again. 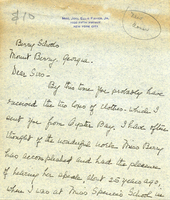 Mrs. Jaeger remarks that she would have written Miss Berry earlier had it not been for her granulated lids which prevent her from reading and writing. 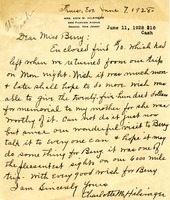 She closes the letter by wishing Miss Berry to have a wonderful summer and also enclosing a check for "Oliver." Miss Helen B. Smith thanks Martha Berry for the 25th Anniversary calendar and sends a $10.00 check, in honor of her mother, for the Anniversary fund. 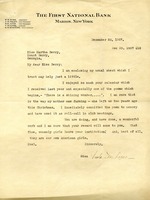 This letter was sent by Miss Viola Luce to Miss Berry with a check for $10.00. She also tells Miss Berry about her love for a poem Miss Berry wrote. 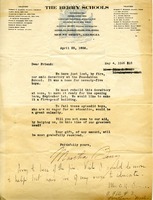 This letter to Mrs. Goldmark asks for any donations she can spare so more young people can go to Berry. A $10 donation is recorded in the corner. 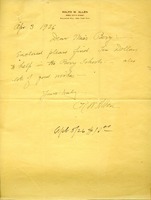 Letter from Ralph W. Allen to Miss Berry containing a donation of ten dollars for the Berry schools. 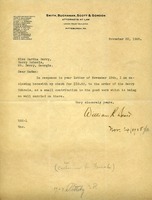 The letter asks for scholarship donations and shows a receipt of $10 from Haas and Allen Race.